Gatekeeper offers a secure system which manages all aspects of entry and exit into and out of events, venues and designated areas (such as VIP or staff only). It can operate either as a stand alone system which counts (and if required limits) the amount of people entering or leaving your event or designated area, or it can operate in conjunction with a ticketing (scan) system and so provide an automated and controlled entrance system to your event. An intelligent turnstile, it links directly to an easy to use central computer system which gives accurate, real time capacity data. Quick to install Gatekeeper facilitates full scanning capabilities and is compatible with any scan methods. Gatekeeper can work in partnership with event organisers, ticketing and scanning companies to reduce ticket fraud by combining a solid physical barrier with the latest ticket scanning technology. 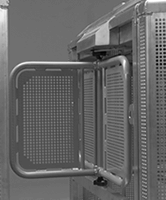 The cross-shaped turnstile of the Gatekeeper system creates a physical barrier to your event or designated area. It incorporates an automated locking system, preventing access once your capacity has been reached. The Gatekeeper can be combined with Mojo Barriers’ standard barrier system to link entrance points and create emergency exits. 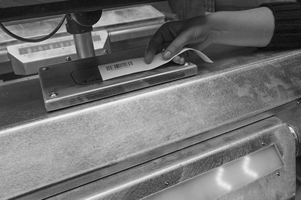 The Gatekeeper system is compatible with any scanning technology from barcodes to RFID and QR codes. It can be adapted to hold any form of ticket scanning hardware, negating the need for hand scanners and the labor required to operate them. The system is programmed to only open once it receives a signal from the ticketing company’s database that the ticket is genuine, cutting down on ticket fraud. Mojo Barriers requires no access to this data, ensuring it remains safely in your hands. Mojo Barriers has developed a specialist software program linked to the Gatekeeper, allowing you to control all entrances and exits from one central workstation and see or respond to any ticket issues quickly and efficiently. From here you can control the system with settings including ‘Count’ where it counts people coming in, ‘Limit’ where gates lock automatically once capacity is reached and ‘Differentiate’ where the system counts people in and out in real time.